Trust me when I tell you that these little truffles won't last very long. They're the perfect sweet treat. I had leftover cake, so I thought it was the perfect excuse to test out some truffles. To see the recipe for the cake I use in this recipe, click here. One of the fun things about making truffles is that you can roll them in whatever topping your heart desires. The sky is the limit. I used a mixture of chopped almonds, shaved coconut and grated dark chocolate. But use whatever toppings you're in the mood for! For something fun and different you could roll them in sprinkles. Options for toppings - chopped almonds, shaved coconut, grated chocolate, or whatever else you have in your pantry. 1. Blitz the cake in a food processor. Set aside in a mixing bowl. 2. Melt the chocolate in a heat resistant bowl over a pot of boiling water. Stir until the chocolate is melted and smooth. Remove from heat and allow to cool slightly. Stir in the cream until smooth. 3. Mix into the cake crumbs. Allow to chill in the fridge for 30 minutes. 4. Roll mixture into balls. Place on a tray with wax paper. 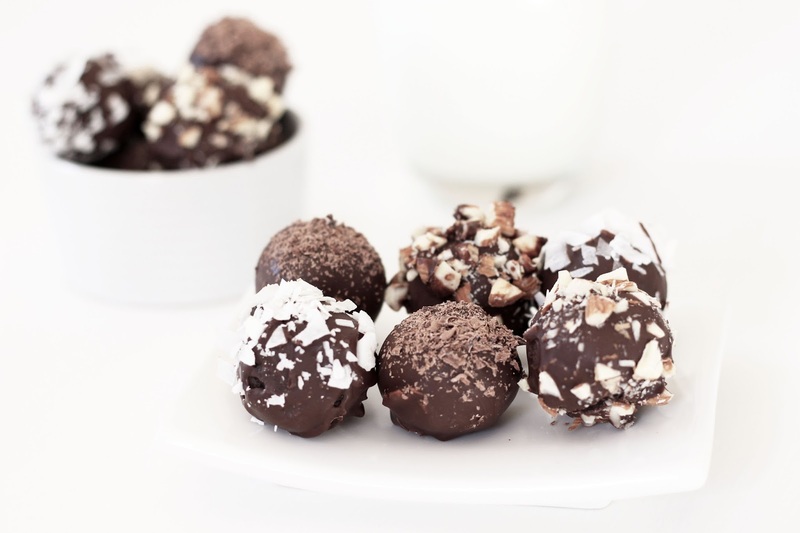 Return to the fridge until the truffle balls are hard. 5. 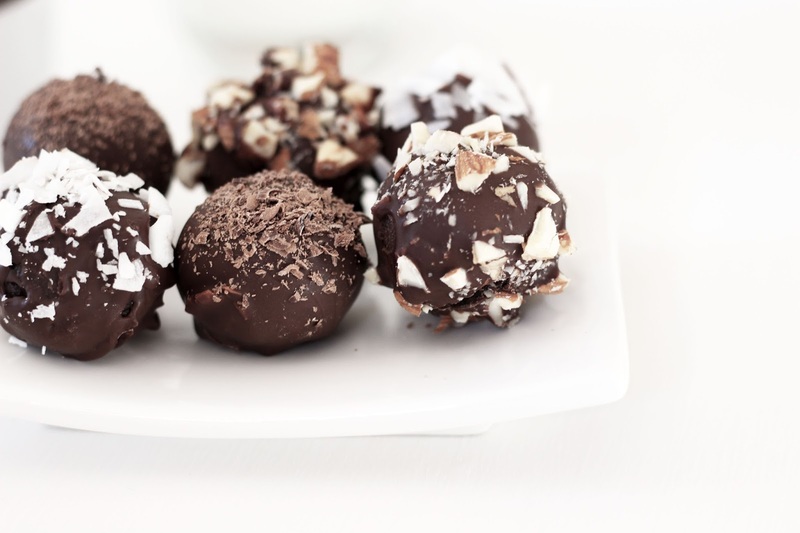 While the truffles are chilling, melt the dark chocolate over a double boiler again. Add the coconut oil and stir until creamy and smooth. 6. gather your toppings together and put them in small bowls. 7. 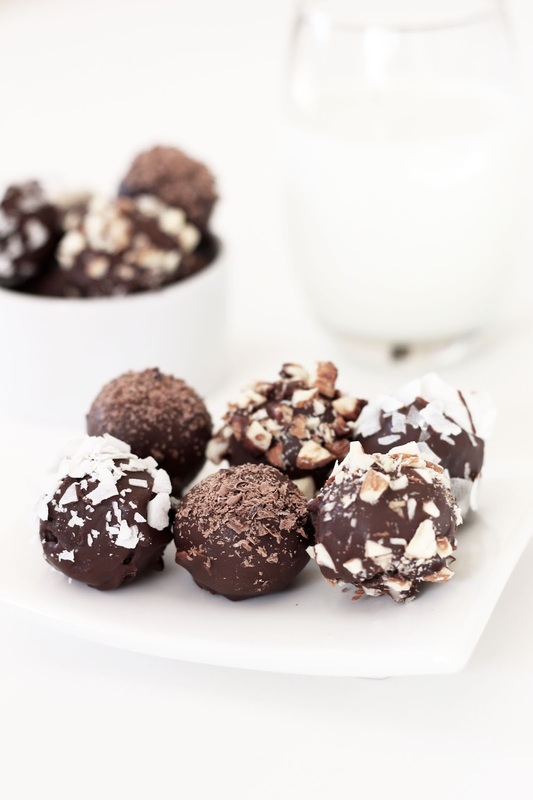 Dip the truffle balls into the chocolate mixture and then either roll or sprinkle truffles with your toppings. 8. Place the truffles on a wire rack to set.